Ra.one released today. How well the movie do, only time can tell. Then we will again fall in the debate of Amir Vs SRK. But what I intend today to write about is promotion skill of AK vs SRK. 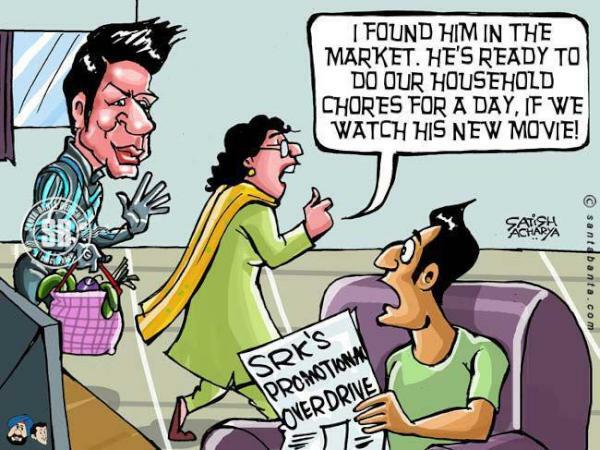 Promotion of Ra.one has not gone well among the viewers. Internet is flooding with jokes about over promotion of Ra.one. So what’s the threshold? How much of promotion is too much? What creates the difference. AK seems to hit all kinds of right cords. Be it RDB, Ghazini, TZP or 3 idiots. How does Amir handle this? He goes in for publicity instead of promotion of the movie (exactly). If the movie (and most of his recent movies had) has a social subject, it’s easy to go out in public and talk about it. AK does not make a lot of public appearances so when he talks, it catches eyeballs easily (high brand concentration). This also creates goodwill in public and they feel obligated to watch the movie (somewhat). Once you have their attention an OK promotion of the movie is enough to bring them to theaters. What to do when he is making movies like Ghazini? Well, he talks about body building and the hair style. Again, the movie (product) talk takes a backseat. So, inherently he is promoting the movie, but public does not feel suffocated. which I liked- especially game. Introducing superhero is really difficult. A game I think is the best idea to introduce the superhero and his powers. But I think this came little late. The best phase of the promotion of Ra.one was when they released the songs- Chammakchallo. It was a catchy number. It had Akon and it was timed around IPL (with which Akon has some relation). But all other things have been quite ineffective. Promoting movie is perhaps the most difficult task. You don’t really have a brand (and when you have, saving it from dilution is another challenge), loyalty is quite low (especially in Bollywood, southern movie industries still have this) and when promoting- you are supposed to tell enough to make them interested and at the same time save enough suspense to hold them at movie theaters! As the percentage of initial week collection is on rise- movie promoters are increasingly concentrating on creating interest part. We have a long way to go to perfect the art of movie marketing.